Same catalog # and all info same on j-card I have an edition with a tan tape w/ yellow labels. Looking to sell, anyone familiar? I just found this copy at a store in NJ, US. Does anyone know the year of this release? Also I noticed the phonograph copyright year of 1965 but the original release was 1966. This makes me confused. Any help is appreciated. sono passati 4 giorni dal pagamento e non stai facendo niente..
Of course I traveled with my Stones albums and listening to Dylan with the passion I did raised many eyebrows among my friends. So when I showed up at school with this Blues Breakers album, I felt that I had stepped across some sort of imaginary line that indicated unacceptable behavior. The album cover was not attractive in the least, but for me it was compelling, revealing a gritty side of life that didn’t just call to me, it shouted my name out loud. I loved this cover, a true snapshot, nothing posed [though I was to find out later that it really was extremely posed], nothing manipulated, just the guys sitting at a train stop, waiting to relentlessly move on. I got it [!] ... for once it wasn’t about the clothes, or the cool hair cuts, it was about the music. This cover was not lost to the thinking of other musicians either, it became a subliminal message for saying, “It’s not about us, it’s about the music.” This cover has been copied in many variations, with probably the most famous being by Crosby, Stills, and Nash. But it was what was inside that really got to me, this was like the music that came in on my small transistor radio during the wee hours on damp rainy nights; from places like Galveston, Baton Rouge and Memphis. I loved it, even if I couldn’t dance to it, because it settled in a fresh new spot, and I was addicted to the feeling. Oh yeah, I put the colourful scarves over the lamps in my room, creating atmosphere ... my head, neck, and shoulders developed their own relationship, and I tapped my foot in a very sexual manner. There were many changes taking place, and I was listening to the right thing at the right time. Even the most superficial spin of this disc lets you hear what all the fuss was about. 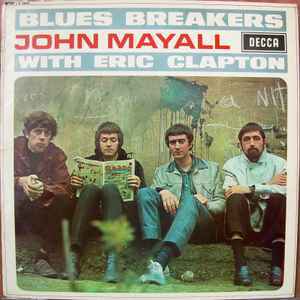 It gets under my skin that John Mayall & The Bluesbreakers have so unfairly been relegated to a lesser place in musical history, when all it takes is a listen to a song like “Parchman Farm,” to show you all that Cream would ever be. All of the music found here is innovative, and fluid ... just float with “What’d I Say,” hear how wonderfully they slow it down, and those choice notes from The Beatles “Day Tripper,” never fail to put a smile on my face. It is easy to see why John Mayall has remained such a propionate figure to so many, he not only uses instruments in ways that compliment each other, but the man has chosen cover songs that compliment his original works seamlessly. This is probably the first non jazz album I had ever heard that allowed its members to stretch out with precision, traveling without wondering aimlessly. This music is as bright and fresh as the day it was recorded ... it’s timeless and will endure through the ages. It doesn’t matter what genre you dig most, this is essential listening, and has effected every musician out there in one way or another, whether they know it or not. If you don’t own this album, shame on you ... if you’ve been meaning to score yourself a copy, then by all means get out there today and do so. *** The Fun Facts: The album is also known as 'The Beano Album' because of its cover photograph showing Clapton reading The Beano, a British children's comic. Clapton stated in his autobiography that he was reading The Beano on the cover because he felt like being "uncooperative" during the photo shoot. The photographer was Derek Wedgbury and the location was near the Old Kent Road. Despite being listed on the album jacket, Eric Clapton was responsible for but one single song on the release, and even that "Double Crossing Time," was co-penned by Mayall. Originally, John Mayall intended for his second album to be also a live venture in order to capture the guitar solos performed by Eric Clapton. A set was recorded at the Flamingo Club, with Jack Bruce (with whom Clapton would subsequently work in Cream) on bass. Due to the shaky recordings of the concert and the lack luster quality of the performance, the adventure was cancelled. I have a copy of this version, but can't figure out why this pressing seems to be so much more valuable than others pressed at the same time, seemingly no different other than pressing plant. Any help? Thanks. This is not a 1966 release. The photos show a 1969 copyright on labels.